Nattokinase supports the body in breaking up and dissolving the unhealthy coagulation of blood and to support fibrinolytic activity and may help to lower blood pressure. esearch has shown Nattokinase? to support the body in breaking up and dissolving the unhealthy coagulation of blood and to support fibrinolytic activity and may help to lower blood pressure. The human body produces several types of enzymes for making thrombus, but only one main enzyme for breaking it down and dissolving it - plasmin. The properties of nattokinase closely resemble plasmin. According to Dr. Martin Milner, from the Center for Natural Medicine in Portland, Oregon, what makes nattokinase a particularly potent enzyme, is that it enhances the body's natural ability to fight blood clots in several different ways; Because it so closely resembles plasmin, it dissolves fibrin directly. In addition, it also enhances the body's production of both plasmin and other clot-dissolving agents, including urokinase (endogenous). 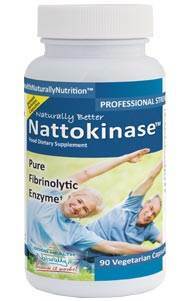 Nattokinase is a highly purified enzyme that is extracted from a popular Japanese food called natto. Natto is boiled soybeans that have been fermented with a bacterium called Bacillus natto. Natto has been used as a folk remedy for diseases of the heart and circulatory system (cardiovascular disease) for hundreds of years. Nattokinase may help prevent hardening of arteries. Nattokinase shows promising results in Cerebral hemorrhage or infarction, Hemorrhoids and varicose veins, Senile dementia, Diabetes, Fibromyalgia, Muscle spasms, Poor healing, Chronic inflammation. Rutin is a plant pigment (flavonoid) that is found in certain fruits and vegetables, found to have the ability to help strengthen blood vessels, and has been used for varicose veins, internal bleeding, hemorrhoids, and to prevent strokes due to broken veins or arteries (hemorrhagic strokes). Rutin could be effective at preventing both the arterial clots that cause heart attacks and strokes and the venous clots that cause deep-vein thrombosis and pulmonary embolism, even though the two types form by different mechanisms. Timeless Remedy - In its food food, Natto has been used for over 1000 years. For its blood/cardio health benefits, it has been widely used for over 50 years, especially in Japan. Supports smoother blood flow - Nattokinase? normalizes fibrin, which leads to smoother circulation of blood. Nattokinase? is great for supporting normal circulation while sitting for long periods or taking those stressful long-haul flights. Nattokinase? is perfect for vegans. Researched- This enzyme has been researched throughout the world with substantial results in many studies. It has had over 50 studies and papers published on PubMed over the past 30 years. GMP - manufacturing ensures every stage and material is analyzed and audited to ensure maximum stability and activity.